The friendly, little feline sitting on your lap has a long and predatory ancestry. Its family tree is unusually complicated and only recently has been deciphered. 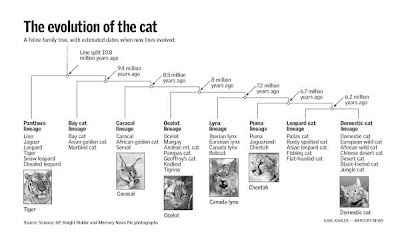 It appears that all modern cats developed about 10.8 million years ago in Southeast Asia. These were not the first cats. Nimravids, similar to a saber-tooth, date back 35 million years ago, but there descendants went extinct long ago. Today there are 37 species of Felidae from the tiger to the tabby that form 8 lineages. A distinctive feature of all cats are their highly developed predatory skills-fast, dexterous and with five weapons (four clawed paws and a mouthful of fangs), evolution has created few predators more perfect for the task. Yet, all cats in the wild are currently threatened with extinction. The ancestor of today's cats was a panther-like creature that split into the big cat families of today, Panthera. Panthera includes the following species: lions, leopards, jaguars, tigers, snow leopards, clouded leopards and Bornean clouded leopards. Wherever these cats live, they are the dominant predator. All of them roar, except for the two clouded leopards. 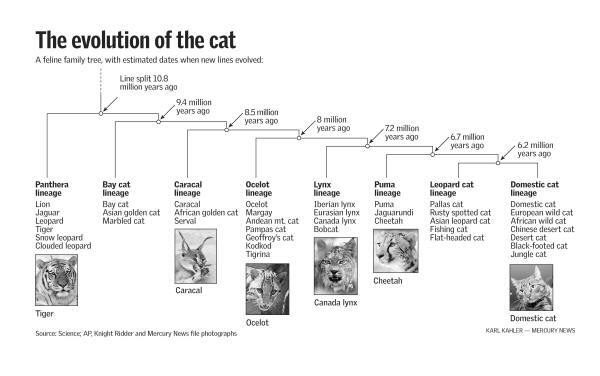 A little over nine million years ago, the bay cat lineage formed. Small to medium in size, the Bay cats, Asian golden cat, Bornean bay cat, Marbled cat, are limited to forested areas in Southeast Asia. The next split came 8.5 million years ago with the caracals. The caracal, African golden cat and serval are all native to Africa. They have distinctive long legs and large ears. During the time that cats were developing distinctive lineages in Africa, they were also traveling to North America. About eight million years ago, the ocelot family formed. The ocelots, Geoffroy's cat, kodkod, tigrina, Andean mountain cat, pampas cat, margay and ocelot reside in Central and South America. The ocelots have 36 chromosomes, all other cats have 38. A little over seven million years ago, the lynx ancestor formed in North America. Besides their short tails, unique among cats, they lynxes have shown a tendency for wide dispersal. They live in all the northern temperate climates of Europe (Iberian lynx), North Asia (Eurasian lynx) and North America (Bobcat and Canada lynx). Cats in general are adept at spreading to new areas. As they reach maturity, males move on to new territories. This has allowed cats to spread from Asia to Africa and from Asia to North America and then South America. Amazingly, this migratory tendency has then allowed new species to develop in the Americas and migrate all the way back to Africa. This evolutionary surprise is found in the Puma lineage that formed 6.7 million years ago and split into the Puma (North and South America), jaguarondi (South America) and cheetah (Africa). Usually the large cats of Africa are thought of as closely related--lion, leopard, tiger and cheetah. However, the cheetah's closest living relative is the puma of the America's. The American cheetah went extinct in North America long ago. The ancestors of the leopard cat also came from America and formed about six million years ago. The Asian leopard cat, fishing cat, flat-headed cat, rusty-spotted cat and Palla's cat would become the dominant feline lineage in Asia. Finally, over three million years ago, the cat we are most familiar with, the domestic cat and its close relatives, the wildcat, sand cat, black-footed cat and jungle cat, began their lineage. Somewhere between Israel and the Near East, about 8-10,000 years ago, the cat was domesticated from the wildcat, creating its own specie. While nearly all the other cat specie's face survival threats in the world today, the domestic cat flourishes at about 600 million. Sometimes, it is hard to imagine that the purring, happy cat rubbing against our leg has an ancestry as one of the top mammal predators of all time. Only when a mouse or even a toy catches its attention do we glimpse a predatory instinct as basic in the tiger as the domestic cat.